If I were to claim to have a super power it would be this: I can hear hummingbirds nearly all the time…when I’m outside of course, and when it’s daytime, and when I’m in San Diego or other happening hummingbird spots. They seem to follow me around, and it’s awesome! I think about hummingbirds often and the little buzzing birds have been a major source of inspiration over the years. Hummingbird encounters at my favorite local park are what really inspired me to write The Adventures of Enu. I look at hummingbirds as little reminders to be present. There have been countless times I’ve been out mindlessly walking and then out of nowhere comes the peculiar call of the hummingbird to wake me up again. A few years ago, when I was just getting into leading surf/yoga retreats internationally, I found myself completely overwhelmed by all the things we had to do to get ready for the trip. At the time I was working with a great friend and professional surfer John Maher. We were getting ready to take a handful of people down to Nicaragua for a 10 day trip. Doing this type of work had always been my dream, I suppose I never realized how much goes in to doing a retreat. I had so many things on my mind: finding accommodation, working out all the finances, arranging flights from different cities, getting all the surf gear ready, checking the weather and surf forecasts, arranging transportation…The list went on and on. I found myself desperately needing a break from the work. So, I headed over to my very favorite place called San Dieguito Park for a quick stroll. As I drove to the park I was completely lost in thought. Have you ever driven somewhere and then upon arrival wonder how you got there because you had almost no recollection of the drive? Well, that’s what happened that day. I got out of my car and set out on an afternoon stroll around the beautiful park. I went off past the duck pond and on to the hiking trail through the coastal sage scrub and oak trees as I normally do. I had been walking for probably 20 minutes before it hit me. I hadn’t heard a single hummingbird, or bird for that matter, since entering the park! San Dieguito Park happens to be a total hummingbird mecca (my opinion) and I typically hear one within the first couple minutes. What was going on? I wondered. At the moment I began to question what was going on I realized I had been so consumed with thoughts and worries, to-do lists, and arrangements regarding Nicaragua that I had completely missed out on my walk. I was so focused on the future trip and my internal dialogue was so “noisy” that I was hardly aware of anything else. There was no space for anything else. With that realization my internal chatter began to quiet as if someone had turning down a dimmer switch. As that happened the sounds of the birds chirping and chipping began to flow in, and a moment later I heard the high-pitched call of the mighty hummingbirdJ The colors of the trees and flowers even became more vibrant. The beauty and the birds were there the whole time but I wasn’t there for them, I was too busy thinking about were I was going to be. That day has always stood out for me as a reminder to ask myself, can I hear the hummingbirds? This reminder has really helped improve my skills at locating hummingbirds. More importantly however, it’s helped me bring more attention to life. It’s helped me bring that quality of awareness to listening to other people. 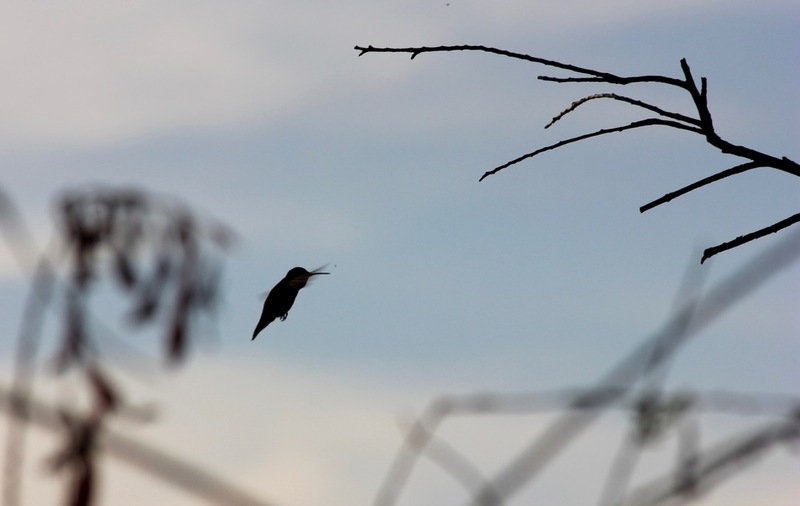 Whether I’m hanging out with friends or family, in a business meeting, leading a one on one session or leading a class I often ask myself, can I hear the hummingbirds? When I ask this simple question it completely changes the quality of my communication, my relationships, and my life.